extremely short recycle times of 0.05 to 2.8 sec. The compact walimex pro Ring Flash HS 400 is perfectly suited to shadow-free illumination for outdoor or on-location shooting. It provide sample power with 400 Watt; the output can be adjusted in 22 steps (1/1 ~ 1/128). The S1/S2 slave trigger and high speed synch, among other things, are supported. Furthermore, the ring flash can be used as a stroboscope flash for amazing lighting effects or simply as an LED video light. To avoid running out of power while shooting, the ring flash has an in-built lithium battery (12.8 V /4500 mAh) with a very fast recycle time of 0.05-2.8 sec. The charger is, of course, included. The flash also incorporates a remote control function that provides wireless control of many flash functions in conjunction with the optional walimex pro remote trigger set operator USB Plus (19695). 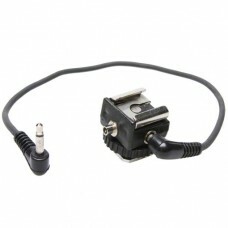 Product information "walimex Universal Flash Shoe"flash shoe with 1/4 inch tripod mountwidth of flas.. Weight: 35gMax. Length: 20 cmMaterial: AluminumBright metallic silver colorMini travel TRIPOD for &n..
very sturdy wall mount boomload capacity up to 4kgtiltable and rotatablechangeable spigotwith conven..
Lithium- Ionen Accumulator walimex pro Ringflash HS 400Strong Lithium- Ionen Accumulator12,6V / 4500..
enduring – compact – mobileinnovative external 2000mAH lithium-ionen battery for camera system flash..
tremendously enduring – very compactinnovative external powerpack for one or two camera system flash..